The purpose of the NSRL is not just to unify the rail systems to the north and south of Boston, and provide the operational and capacity advantages of through-service, but also to link all rail lines systematically to our downtown transit lines – while minimizing impacts on existing buildings and property. Aligning the new tunnels below the existing Central Artery corridor (Rose Kennedy Greenway) accomplishes both goals because it intersects all of the transit lines and is publicly owned. While a few trains will continue to use the existing surface terminals, most will run through the city, stopping at new underground rail stations built adjacent to the Red & Silver Lines, Blue Line and Green & Orange Lines. Cross-platform connections will allow convenient transfers between any of the lines at these downtown stations. Unlike the Central Artery Project, which was built by digging up much of the city, the NSRL tunnels will be built using automated Tunnel Boring Machines, the same method used to build the Red Line Extension in Cambridge and Somerville in the 1980’s and a half dozen water projects in the years since. This technology is highly reliable and cost-effective. Stations will be at about the same depth as Porter Square Station, but larger. 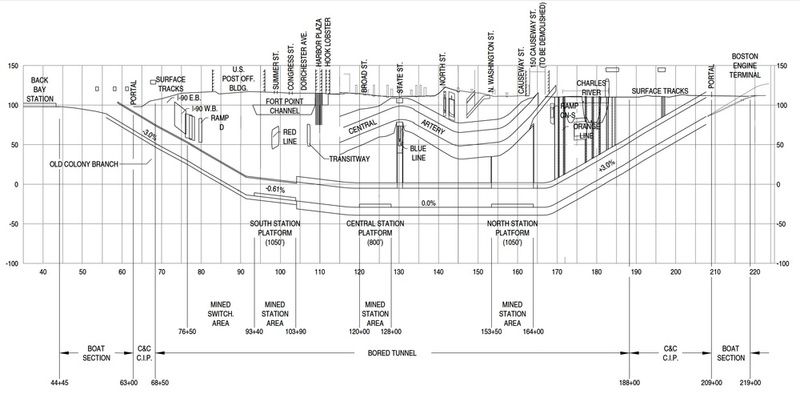 To reach this depth, trains will descend at a 3% grade, starting about 4,700 feet from North and South Station. The total project length is therefore about 2.8 miles. The tunnel openings are called portals, and 5 are required to accommodate the various lines: two in North Point for the Fitchburg Line and the northern lines (Lowell, Haverhill, Rockport, etc. ), one in Back Bay for the Worcester and Amtrak lines, and two in the South Bay for Old Colony and Dorchester Branch lines. The system will be designed to accommodate both intercity (Amtrak) and regional rail equipment. Each station will be designed to provide cross-platform connections between any of the lines operating through the station, greatly improving convenience for users. Intercity trains require platforms 1,050’ long, which will be provided at South Station only. Shorter commuter rail-only platforms will be provided at Central and North Stations. All of the stations will be designed to the most modern standards, with high-performance escalators rising to the transit lines above and also extending out to multiple headhouses on the surface. The horizontal “reach” of these escalators greatly expands the area conveniently served by each station. Because the stations are deep, it is important that they be welcoming and generous. Recently completed rail link stations in Europe and Asia show that this is indeed possible.